International political publication Politico has named Heli Tiirmaa-Klaar, Estonia's first special envoy on cyber security, among the 28 people expected to shape, shake and stir Europe in 2019. "Tiirmaa-Klaar is Estonia's heavy-hitter in the field of cyber diplomacy," Politico said on Tuesday. "She was part of NATO's first cyber policy team, and later, as the EU's first cyber security diplomat, she put in place measures that would allow the bloc to impose sanctions in response to a cyber attack." 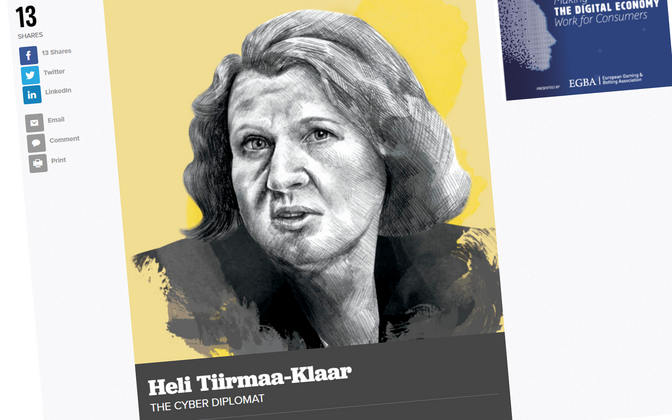 Tiirmaa-Klaar wants to write the rules of cyber conflict, the publication said. On one side of the debate are Tiirmaa-Klaar and her allies in the West, notably the US and large EU states, who are advocating for rules of non-proliferation in cyberspace, proposing to set strict limits on how states use botnets, malware and software vulnerabilities to attack other states and domestic political opposition. On the other side are members of the so-called Shanghai Cooperation Organisation (SCO) led by Moscow and Beijing, who advocate a different approach to regulating cyber conflict that Tiirmaa-Klaar says would make it harder for countries to crack down on state-sponsored hacking activities and cyber crime, while undermining protections for human rights online. Both sides have submitted competing strategies at the United Nations, where diplomats like Tiirmaa-Klaar will be lobbying undecided countries for support, Politico noted. On the list of 28 influential politicians and officials highlighted by Politico, Tiirmaa-Klaar was featured fourth in the category of doers. Those ahead of her include Ine Eriksen Søreide, Norway's first woman foreign minister, Spanish Prime Minister Pedro Sánchez, and European Commission Secretary General Martin Selmayr, who is also considered the most influential official of the EU. Fifth after Tiirmaa-Klaar is former Ukrainian Prime Minister and presidential candidate Yulia Tymoshenko. The other two categories featured on Politico's list are dreamers and doers. Among notable dreamers are Niklas Zennström, one of the founders of Skype, and Finland's Peter Vesterbacka, the creator of popular game Angry Birds who is now involved in establishing a submarine tunnel between the cities of Helsinki and Tallinn. The most notable disruptor featured was British Labour Party leader Jeremy Corbyn, whom Politico dubbed the "Trump of the Left." Politico considered the most influential person in Europe next year to be Italian Deputy Prime Minister and Minister of the Interior Matteo Salvini, who is also head of the right-wing regionalist party Lega Nord. The publication described Salvini as leader of the European populists, whose goal is to reshape the current organisation of Europe. Tiirmaa-Klaar, who has experience with both NATO and the EU, began work as Estonia's first ever special envoy on cyber security in September. Her main duties as special envoy include developing Estonia's foreign policy concerning cyber security, ensuring its coordinated implementation, presenting Estonia's positions within the framework of foreign political platforms, and contributing to international cooperation in the field of cyber security.